Climate models predict increased rainfall and heavier storms for much of the Midwest and Northeast – including on the 90 million acres of farmland that surround the Mississippi River, our nation’s largest waterway. These storms will increase the risk and severity of water quality impacts. Even with sophisticated precision technology to apply fertilizer in the right place, time and amount, heavy rains can quickly wash nutrients into surface water and groundwater. That’s due in part to the widespread use of tile drains, installed to quickly remove excess water off farm fields. These drainage systems have changed the hydrology of the Midwest and have diminished the natural filtering function of soils. More than a hundred years of converting natural prairies, wetlands and riparian areas into cropland has also dramatically reduced natural water filtration. In-field conservation on individual farms must be paired with edge-of-field and watershed-level conservation to fully address the challenges caused by heavy precipitation. Long-term, measurable water quality improvements will require the restoration of wetlands and strips of natural vegetation between farms and waterways. These aren’t the wetlands that WOTUS would protect, but rather wetlands that have already disappeared. In Iowa, more than 90 percent of original wetlands have been lost over the past century. Unlike other conservation practices that have a clear return on investment, restoring buffers, filters and wetlands – even on marginal land – won’t pencil out for producers, bankers or investors. Fortunately, state and federal governments are stepping up with targeted public investment. Iowa, Minnesota and Maryland are providing financial and technical assistance for conservation practices that will deliver watershed improvements with the most bang for the buck. The 2018 farm bill has full conservation funding for programs that provide farmers with incentives to restore buffers and filters across the rural landscape. These efforts are essential complements to the Clean Water Act. Regardless of what happens with WOTUS, nonpoint source pollution is a challenge that affects all Americans and must be addressed. 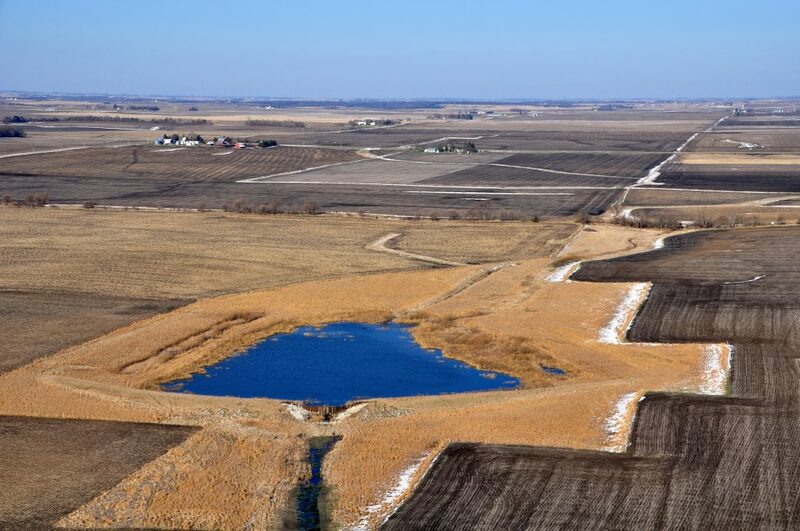 Farmers, environmentalists, departments of agriculture and even public utilities can support watershed-level conservation approaches, including the restoration of powerful natural filtration systems like wetlands, prairies and riparian plant strips. Together, we can maintain agricultural productivity while ensuring safe drinking water and thriving waterways for people and wildlife. This entry was posted in Sustainable Agriculture and tagged conservation, wetlands, WOTUS. Bookmark the permalink. Both comments and trackbacks are currently closed.